Three American professors — Eugene F. Fama, Lars Peter Hansen and Robert J. Shiller — were awarded the Nobel Memorial Prize in Economic Science on Monday for showing that asset prices move unpredictably in the short term but with greater predictability over longer periods. . . .
Mr. Fama, 74, was honored for showing that asset prices are “extremely hard to predict over short horizons.” . 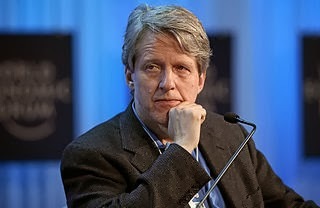 . .
Mr. Shiller, 67, would later introduce an important caveat to the idea that markets operate efficiently, finding that stock and bond prices show greater predictability over longer periods. Mr. Shiller and other economists see evidence that these movements cannot be entirely explained by rational decision-making, and instead reflect the irrational behavior of market participants. Robert Shiller also co-developed the modern methods of tracking home prices used by this blog and my housing graphs website.